With all the entirely appropriate concern we’re hearing these days about the increasingly difficult path to higher education for children of middle-class families, it’s important to remember that the financial obstacles are all the more daunting for disadvantaged kids. 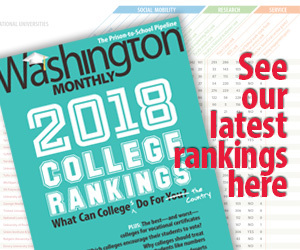 In the new issue of the Washington Monthly, Bladensburg (MD) High School teacher Elias Vlanton, himself a recognized mentor for low-income students seeking to attend college, reviews Hold Fast to Dreams: A College Guidance Counselor, His Students, and the Vision of a Life Beyond Poverty. The book is a personal reflection by Joshua Steckel (assisted by his wife, Beth Zasloff, as co-author), who abandoned a perch at a tony private school in Manhattan to become a college counselor at a low-income public school in Brooklyn. I have taught for more than fifteen years in a Maryland public high school that has demographics similar to those at the Secondary School, and a colleague and I similarly shepherded promising students to selective residential colleges. Steckel’s stories remind me of my own. Hold Fast neither exaggerates nor minimizes what these kids are faced with. Steckel and Zasloff write about the rawness and trauma of the working poor, the family life constantly disrupted by parents’ late-night shifts, long hours at work, and unstable employment. Some of Steckel’s students move frequently (including in and out of homeless shelters), work part-time to contribute to the family budget, babysit younger siblings, and protect them from getting caught up in life on the street. While some dream of going to college, living at the social bottom makes that goal seem beyond reach; others see higher education as so remote that they don’t bother dreaming about it. Reviews rarely inspire me to read books, but this is an exception. Check it out.